You don’t need telling that ­­the costs of studying are truly horrifying these days. Combined with rising living costs (and don’t even mention petrol) it means that most students end up even more cash strapped than ever. But don’t worry – we know a way that you can actually earn money for studying. Sound intriguing? Stuvia, the No 1 student note market place, is making this possible. 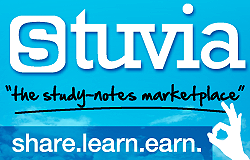 Stuvia enables you to sell study notes and in this way benefit from all the hard work you are ALREADY doing for your degree! We all know that study notes have great benefits, including helping us to remember critical information come exam time. But how do you know how to write good notes? Stuvia also supplies you with help and tips such as how to write study notes, as well as great ideas on how to run your own knowledge store. Did you know that University of South Africa (UNISA) is one of the largest universities in the world? It takes one third of all university students in South Africa! So if you want to buy (or sell) UNISA study notes there is a good chance we have notes (or customers) to help. If you are studying with UNISA there is a good chance you need Stuvia! Join us to see the great UNISA resources on our site. Stellies, UCT, TUKS – you name it – we got it! So why don’t you create your free profile and start browsing the thousands of resources already uploaded? You may see just the ones you need to help you pass the test or exam you have next week. Or you may realise just how much extra cash this awesome platform could help you earn this term! Join us today and find out just how much Stuvia can help YOU this term!